Fair line out and Cailin Miss and Anabring were out the back early with Embrace The Rock. The other six all seemed to want to lead for a while. Eventually Cinnamon Carter held the lead on the rails from Amicus, showing a lot more pace, and Veuvelicious eased to tail a trail. Winesearch and Kaizaen were next and Miss Interiors drifted back past midfield after being up there early. Amicus took over rounding the turn and Kaizaen followed her, pushing Veuuvelicious out of the way, Winesearch dropped off noticeably and Anabring improved at her expense. Amicus shot away with 200m left as Kaizaen knuckled down to chase and they got very close as Amicus wobbled around. Embrace The Rock charged down the outside from last into third, tightening up Anabring and Miss Interiors a bit, with Veuvelicious battling on. Amicus held on to win but lost it in the stewards’ room. Cailin Miss hugged the rails and made ground to run fourth from Veuvelicious who was okay fresh. 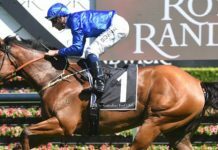 Follow: Embrace The Rock looks a nice prospect over a bit more ground. Are There Any broke quickly from the inside and held the fence and the lead, somewhat unusually. Lorna May and Angelic Lass showed their usual pace and Suavito was handy just behind them. Keep De Rose positioned up nicely outside her. Angelic Lass worked forward to land outside Are There Any and they didn’t look to be going too hard. Lorna May stalked them. Divine City pulled up three wide and Suavito help her place on the fence as they bunched up. Are There Any turned in front and looked to have a kick as Angelic Lass was put under pressure. Lorna May gained a run three out as Divine City hung and Winta Chiller swept around them widest. Suavito had to wait for a run behind the leader and it didn’t come until the 100m where Lorna May went to the front over Are There Any, Winta Chiller kept her run going. Suavito didn’t have long to wind up but she rushed home and her class shone through in an unlikely win. Lorna May was honest and Winta Chiller bobbed up as she can. Disappointed with Are There Any who had every hope in the lead. Keep De Rose was okay Vivi Veloce ran on without threatening. Excuse NadeemLass who almost came down about 300m out. Follow: Suavito is stakes class and this was a super first-up win. Mr Make Believe jumped fast from his inside gate and led comfortably. Henwood landed right behind him and Pillar Of Creation was caught three wide around Bass Strait and Count Of Limonade. Commanding Time took a three wide trail and Eximius eased just off them. Signoff settled midfield on the fence and Text’n Hurley was behind him. Mr Make Believe kept them rolling a several were off the bit before the turn. Henwood wasn’t, though, and he travelled up strongly tackle the leader at the 300m. Eximius made a quick move to the outside and put in his bid as Commanding Time tried to go with him. Mr Make Believe battled on and Bass Strait was just whacking away. Pillar Of Creation was gone on the turn and Signoff stuck to the fence. Eximius loomed alongside Henwood at the 100m but Henwood fought him off and edged clear again. Commanding Time stayed on very well in a super first-up run andOminous charged from the back. Mr Make Believe was next and nice run from Text’n Hurley getting home late. Signoff had restricted room in the last 100m or so but he was one paced, assess him next time over more ground. Same with Prince Of Penzance who made good ground late. Follow: Nice runs from Text’n Hurley, Ominous and Prince Of Penzance. Want to see Signoff again. Merchant showed good pace to lead early but was kept off the fence by Late Charge who jumped okay but booted through quickly. Remagen Bridge and Petrify raced handy to them and Olivier lobbed into a good spot next.Neverending Valley jumped well but eased back into the field and Final Jest was caught wide and eased too. Stamina and Champollion were about midfield. Marwood went a long way back from his wide alley. By The Gracewas ahead of him and stoked up to get moving before the turn. Late Charge held the lead on the turn and beat Merchant off but Olivier improved quickly to be the first to challenge. By The Grace found himself in the clear and was looming up and out wider Neverending Valley and Marwood started to run on, In a driving finish Late Charge just held Olivier but they were rushing out wider with Precious Gem steaming into third ahead of Marwood. By The Grace’s run ended at the 200m and he stuck on for fourth and Aces And Angels worked home well from the back. Of the others Paige’s Boy had no luck when chopped out of it about 300m out and should have finished a fair bit closer. Follow: Precious Gem is close to a win and look out for Paige’s Boy in something easier. Hard Stride was one of the best out and he went forward to find the lead with Couldn’t Agreemore and British General out wider. Uate was handy early and Flamberge railed through behind them. Vain Queen was going to settle better than midfield but suffered a check and dropped back. O’Malley was out four wide in a line around Big Buddie, Smackdown and Lonhspresso. Richie’s Vibe was under pressure a long way out and Vain Queen ended up last on the turn. Hard Stride skipped away on the turn and with Uate under riding Flamberge got off his back to chase. Couldn’t Agreemore battled and O’Malley loomed out wide on the track. Rifleman was behind him running on and Vain Queen was all over the place looking for a run. Flamberge picked up Hard Stride at the 200m and forged clear for an easy win. He’s a good horse and rarely runs a bad one. Rifleman charged home late to grab second and Hard Stride continued his good form holding third. Vain Queen was cut out again in the straight and finally got through for fourth but should have won with a leg in the air. O’Malley was fair. Of the others Richie’s Vibe picked himself up again to make some late ground. Follow: Vain Queen was very, very unlucky. Jabali was fast away from the outside alley but there were plenty booting up inside him with Boomwaa, Cornrow and Forgive And Forget all handy. Novel Dancer landed in a perfect spot just off them. Moonovermanhattan andNordic Empire were next in the clear. Cornrow eventually took over with Boomwaa on his outside and Jabali was stuck out wider. Novel Dancer was being niggled at a fair way out. Cornrow looked to sneak away on the turn and Boomwaa hung out taking Jabali with him. Novel Dancer and Forgive And Forget had room to come through until Boomwaa came back in and Nordic Empire pulled around all of them to run on. The backmarkers were starting to creep into it early in the straight with Nordic Empire sprinting quickly to tackle Cornrow and Awesome Rock was winding up. Out wider Chivalry was unwinding as well. Nordic Empire had the lead at the 100m but was alll out and Chivalry finished over the top of him to score. Awesome Rock’s run ended but stuck on for a close third and Forgive And Forget was the best of those on the pace. Stingray probably should have run a clear fourth and another nice performance from Zululand getting home late. Novel Dancer was too bad to be true. Follow: Obviously Chivalry has come back well, Nordic Empire was brave, keep Zululand on side for when he gets to a mile. Even line out and A Time For Julia and Gregers were left to take up the running with nothing else wanting to lead. Thiamandi was handy and Real Surreal and Hazard pushed up underneath her. Dear Demi jumped well but eased back. Forever Loved and Sino Eagle, out wide, were in that bunch and Commanding Jewel was three back on the fence in a very bunched field. A Time For Julia was asked to sprint on the turn and Gregers stayed right with her as they got away a length or so. Real Surreal followed the leaders but couldn’t pick up and Hazard worked into the clear in plenty of time. Commanding Jewel was playing for luck through the field and a gap opened for her about 250m out. Forever Loved missed that run and had to wait. Gregers got to A Time For Julia just inside the 100m and did enough to score from A Time For Julia and Commanding Jewel who hit the line together, the latter a little unfortunate the way the race was run. Forever Loved got out late to charge into fourth and a nice little first-up run from Dear Demi. Of the others Hazard had her chance and Real Surreal was a bit plain though she did get tightened up by Commanding Jewel in the straight. Follow: Commanding Jewel has come back super and Forever Loved was excellent. Sweet Idea made a beeline for the front and got there pretty easily. Moment Of Change didn’t jump nearly as fast but worked into second with Dissident lobbing into a trail. Puissance De Lune and Messene settled next and Happy Trails was about midfield. Boban found himself stuck three wide for the trip. Silent Achiever was next. When Sweet Idea backed off the tempo a little Moment Off Change moved up to serve it up to her. Dissident was cruising behind them and Messene seemed to have a nice run next. Puissance De Lune stayed on the fence. On the turn Boban was the widest but not picking up. Sweet Idea shrugged off Moment Of Change who dropped right out and Dissident made his move at the 300m. They were a few lengths clear of Puissance De Lune and Messene and Silent Achiever crept along the fence. Dissent went straight past Sweet Idea and he put three lengths on her in a stunning first-up win. Sweet Idea was very brave after being attacked and Puissance De Lune ran an improved race. Nice fresh run from Silent Achiever and Boban was okay. Behind him Sertorius finished his race off very well. There were some huge flops here from Moment Of Change, Messene and Happy Trails. Like to see Super Cool again as he was first-up since last spring. Follow: Dissident was awesome here and stay with him. First Course worked to the lead after 200m or so and led up from Mr O’Ceirin and Marksmanship. Single enjoyed a nice run in the clear as they strung out. Brambles and Goldoni enjoyed good runs a few lengths back andStipulate was on their back. First Course had them running in front but was under the whip before the turn. Mr O’Ceirin was first to loom up but Marksmanship was going better than him. Brambles sprinted up quickly as well and Stipulate followed him home. 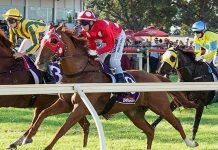 Marksmanship hit the lead a fair way out but Brambles and Stipulate reeled him in inside the 200m and Stipulate broke well clear in the last 50m for an impressive first-up win. Brambles ran a nice race again and Marksmanship will be fitter for his first run in a while. Behind them Single battled on okay and Mr O’Ceirin was weakening late. Let’s Make Adeal had no luck in the run and she kept coming to be just behind them. Nothing else ran on to any significant degree. Follow: Stipulate impressed, improved run from Let’s Make Adeal. Specials from the meeting: Dissident, Commanding Jewel, Vain Queen, Embrace The Rock. First Seal was the quickest to begin from the inside and led early, until Hampton Court kicked up around the outside to take it up, with Echo Prince going to second on the outside and First Seal took the sit on the fence behind the leader. Harrier Jet was not far off them in fourth. Into the straight, Hampton Court came way from the fence giving First Seal the opportunity to come through on its inside. They fought it out for a little while until Sweynesse drove right through along the fence from last to move away for a pretty good win given it gave them a start and a beating. Burning Passion was back near last also on the turn and chose to come very wide. It made some ground initially but then was never a winning chance. Cuban Star was slow to go and Scaletini didn’t have any pace early on. Made To Order was up there initially until Miss Venus and Don’t Tell Linda took it up, with Senta Helga working around them into third and Zazparella getting a good run back on the fence in fourth. 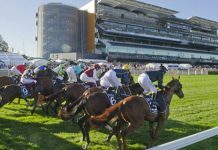 Just inside the 600m mark, the breaks came to let Zazparella off the fence as several runners were placed under pressure. Around the turn, Miss Venus made a bid for victory with Zazparella now being pushed along to chase out after it. At that point Blazing Dragon had worked its way into third. Up to the 200m mark Miss Venus still had the front, but it appeared obvious that Ambivalent was coming with the strongest run. She claimed the lead just before the 100m mark and looked set for a good victory. You have to give credit to Zazparella here though who was asked for its effort before the turn and still fought it out all the way to the line. The 2400m ‘cup of tea’ race was the third on the card. By the time they went out of the straight Princess Sophia had worked up out wide and gone to a clear lead from Mullet Man and Tohunga. Not long after, Princess Sophia had about a 4 length break, with Tohunga on the outside in second and Mullet Man back on the fence in third. The eventual winner Georgey Aeroplane was getting a nice run not far off the pace. If you were on Georgey Aeroplane at the 600m mark when it started making ground you were on very good terms with yourself. Around the turn, he shot clear and it was a one act affair from there on. In the run to the line he kept going further in front, from a pretty brave Forever Crazy who held off Khalid for second place. The winner was a mile too good here, assisted by a great ride by Australia’s best Jockey, Hugh Bowman. Not a bad line out here with Maysoon quick to begin along with Runway Star, but Maroon Bay kicked through to take it up. Oh So Adorable was out three wide up near the speed. In the straight, Maroon Bay traveled well and had a kick just before the 200m mark. Runway Star was a bit cramped for room, but got out in time and couldn’t run down the winner, along with Maysoon. Jemericafound good support in betting here and put a run in out wide early in the straight but that was short lived. Another good ride here to take up the front and rate things to a nicety. Tougher Than Ever wasn’t good to begin here. Beyond Thankful, who was sent out favourite began nicely and took it up in front from Mighty Lucky. Tougher Than Ever railed through into third and fourth after its slow start, with Rugged Cross on its outside. Beyond Thankful seemed to travel ok up to the turn, but soon after straightening was in all sorts as Tougher Than Ever went up to challenge and then out wide Rugged Cross put in its claim. Those two fought it out with Rugged Cross going home too well and getting the win. Eigelstein and Lucky Chappy worked home ok into third and fourth from well back. A great line out in The Run To The Rose with Sniper Fire leading out from Ygritte. Nostradamus got a lovely run in third with Almalad outside of it. Around the turn, Nostradamus gave Almalad the shoulder to get into the clear and you thought he was going to run past the two leaders, however soon after he was under pressure and beaten along with Almalad. At about the 200m mark you could see Hallowed Crown right out wide had built up momentum and was going to be the one to beat. In the run to the line it looked very impressive as it came away to win as it liked. The run ofKumaon was also good coming from back and having to work away from the inside. A very impressive winner, but the question mark I have is whether the wet track flattered it and how much did the wet track impact Nostradamus and Almalad. I wouldn’t write either of those off yet although they finished at the tail. In The Premiers Cup, Greatwood began well and He’s Your Man rolled up from out wide to go into second, with Bonfire getting a nice run on the fence in third. Not a lot changed throughout here with Greatwood getting a good run in front, and He’s Your Man happy to not apply any pressure on its outside. Celtic Prince and Sabor A Triunfo were both caught wide back in midfield. Early in the straight, Greatwood sprinted for home and that proved a decisive move as he was never going to be run down from there on. He’s Your Man tried hard, but was eventually run down by Bonfire for second spot. Not many others did anything here, although Celtic Prince can be forgiven after cutting the breeze out wide. Scandiva ran the gates and led initially until Fort Sumpter moved up on the outside to take over. Two Blue got up along the fence to join Scandiva in second place. Midrace, Mount Nebo was out wide and as they approached the turn he was let stride closer. In the straight, Cluster who had been back last was pulled widest and looked to be coming with a strong run. Inside the 200m mark Mount Nebo and Cluster were the two most were concentrating on and as this was happening Weinholt was finishing powerfully right up against the paint. He was the one that finished best and got the win. The run of Cluster still has to be considered a good one after being wide, and Mount Nebo shouldn’t lose any admirers either. Reflectance ran another good race here, but I have to wonder whether it knows how to win.